Discussion in 'The Lounge' started by lovebunny, Oct 21, 2012.
heres the pics i got of the frame! A FRAME? A goddam picture of a FRAME? Man, you gonna drag this out longer that a David Letterman joke. 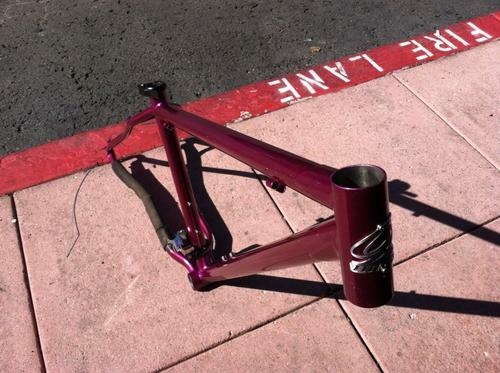 Wow that is a really nice price for a Reynolds 853 frame and I think one of the best looking 29 frames out there and cool paint job its begging for a purple handle bar. My best advice is go short stem and wide bars 760mm or bigger you will love it. Buying all new parts? Why not go 1x10? because the 6.6 is getting the 2x10 treatment. and the niner gets the old parts.